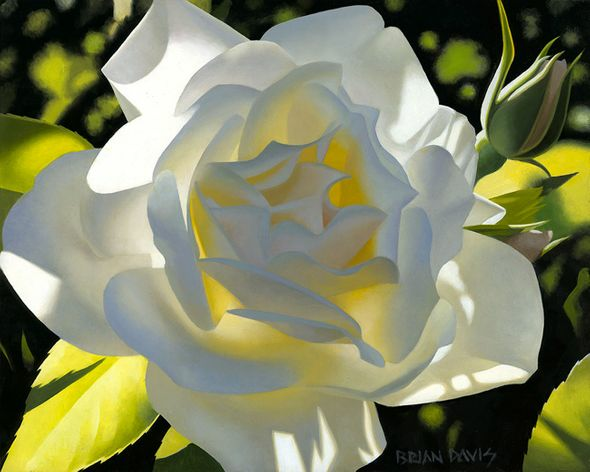 Brian Davis Hand Signed and Numbered Limited Edition Giclee on Canvas:"Divine White Rose"
Edition: Giclee Canvas, Artist Signed and Numbered to 95. COA. ""The light is the real subject of my work,"" Davis says. ""The flower is the stage, and the light is the dancer."" The artist now lives in Los Angeles, California where he has shifted his artistic vision to portray the LA Street Scene series. As the traffic and people converge on the city of Los Angeles, Leandro stops during his journey to capture a moment in time. He photographs the urban landscape, takes notes and sketches the specific location where he is. He wants to remember the activity, the energy, and the colors that have made a such a deep impression on his mind. Later he will translate this vitality and intensity onto canvas."